November 9 was the final Autocross in the 2013 season, and I brought the Elan. 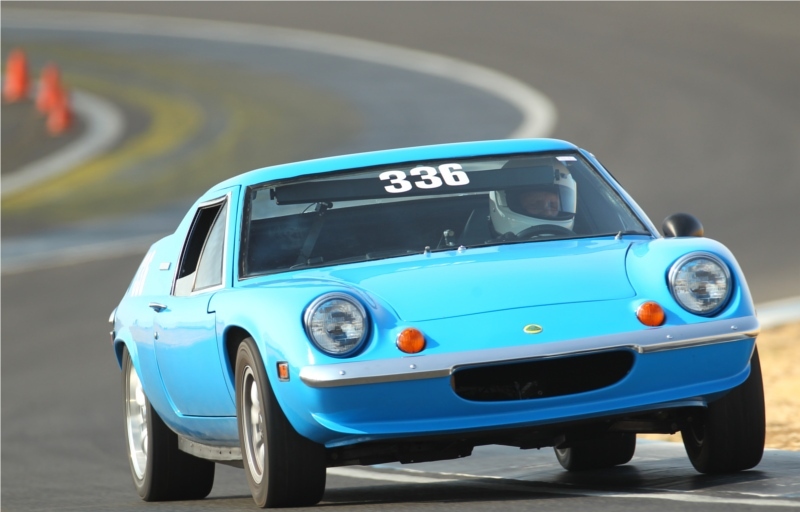 It's a stock Elan restored as a 1972 Lotus Elan Sprint. There were a lot of right hand turns which are the worst for the nearly-stock oil-pickup setup so I was worried about that traditional weak point with a Lotus TwinCam engine but ran as hard as I could anyway. My best of five runs was 58.005 seconds. Thanks to Cliff Brunk for the photo. Saturday it rained all morning, and as few had rain tires little happened till we were allowed out in the third session with street tires. Driving on the wet track in the rain was a lot of fun but series director Robbie Montinola decided to make Saturday practice-only postponing race 1 till Sunday. By the fourth session the track was dry so everyone went out to practice. Sunday was dry, cool, and sunny. Perfect. Session 1 was practice, session 2 was timed practice and Time Attack arranging the faster cars at the front and leaving gaps so everyone had some clear laps. Session 3 was race 1 and session 4 was race 2. 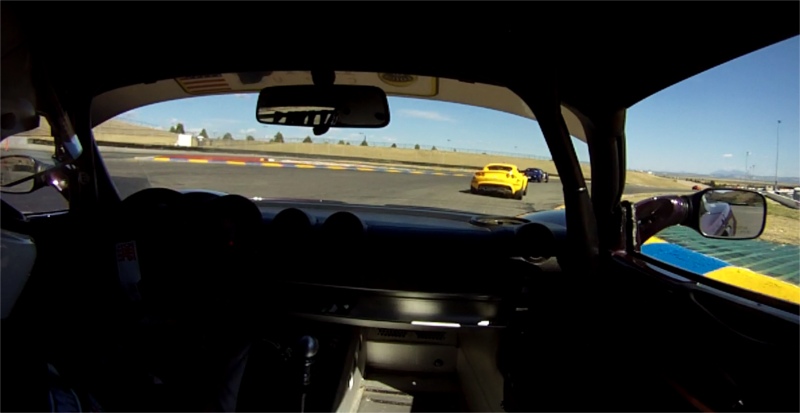 In race 2 4 of us mid-pack were nose-to-tail lap after lap. Now that was a lot of fun. The picture below is forming up for a race. Robbie M. is helping us get into the right order. Your correspondent is in the Auburgine (purple) Exige. The following picture shows part of the garage and a part of the LotusCup field while we wait for time-on-track. The next picture is on track in race 2. 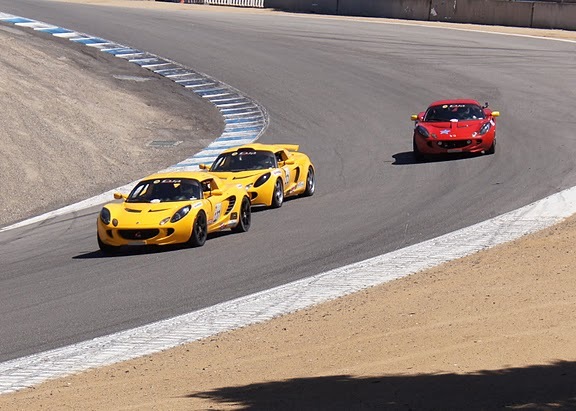 The four of us were close for many laps, this scene is from my movie camera and shows three of us exiting turn 7, the red Elise having gotten a bit ahead. August 3 was the first Sonoma Raceway (previously called Infineon Raceway and Sears Point Raceway) event for the GGLC in more than ten years. The Shelby American club very ably ran the overall event and the GGLC took the 8am-9am hour as well as five 20 minute sessions spread through the rest of the day. The GGLC had its own registration and driver meeting. The meeting was in garage #40 at 7:15 AM as we all wanted to be on track during that first 8AM hour. 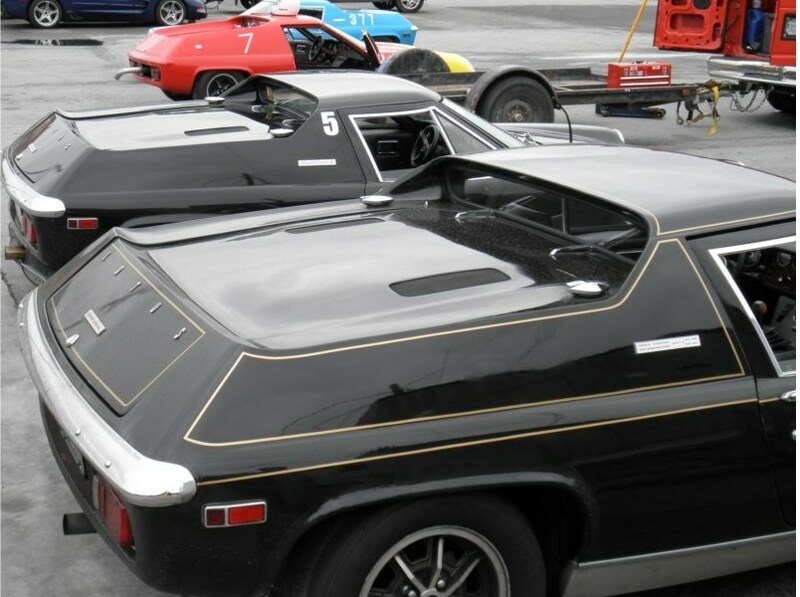 Our group was all Lotus cars, over 30 of them. Two Lotus 23s, two Europas, 3 Sevens, a 2 Eleven and the rest were Elise and Exige. This was the first outing for Europa after revising the radiator to be 225 square inches (stock is 131 square inches) and revising the exhaust to be simpler and quieter. The low tone of the new exhaust should make passing sound at Laguna Seca easier. The revised oil and fuel plumbing performed as I hoped --- there was no drama at all. The nice entry count meant there was often someone to pass or passing one making it interesting. Yet one also had plenty of clear laps. It was all open passing after the first 30 minutes of the day. Of course being a trackday the rule was to let folks by: if they come up behind you they are faster! It is not a race. One stays on line and lifts just a little if necessary (at a safe place) to ensure the passer has an easy route by. Of course when the 2 Eleven came by lifting throttle was superfluous --- the 2 Eleven simply drove by easily. Photos copyright Dito Milian, GotBlueMilk.com The first picture below is in the Esses. The 2013 West Coast Lotus Meet took place July 4-7 and was based at the Red Lion Hotel in Bellevue Washington. Bellevue is a very nice part of greater Seattle and its city center was in walking distance of the hotel. We had DietschWerks trailer our 1966 Red/White Lotus Elan to the event on their multi-car trailer as we did not have time to make the drive. And then the horrible crash at San Francisco International of a passenger jet July 7 meant we had little chance of flying home, so we drove the Elan the 820 miles (mostly on I-5). We drove from Seattle to Mt Shasta (town) the first day and then home to Burlingame the second day. With outside temperature at 100 degrees F on I-5 it was long trip. Aside from a difficulty with the throttle (on the second day it was unwilling to return to idle without pulling the throttle back with a foot) the Elan performed well and got us home, albeit some hours after our scheduled flight did actually arrive in San Francisco. Our fuel usage gave us a measured 35 MPG. The cars pictured are a random grouping in the parking lot of the Red Lion (of the 50+ Lotuses at the event overall). Ours is 4th from the left in the back row. This was round 4 of the LotusCupUSA west coast series and the first round I participated in. 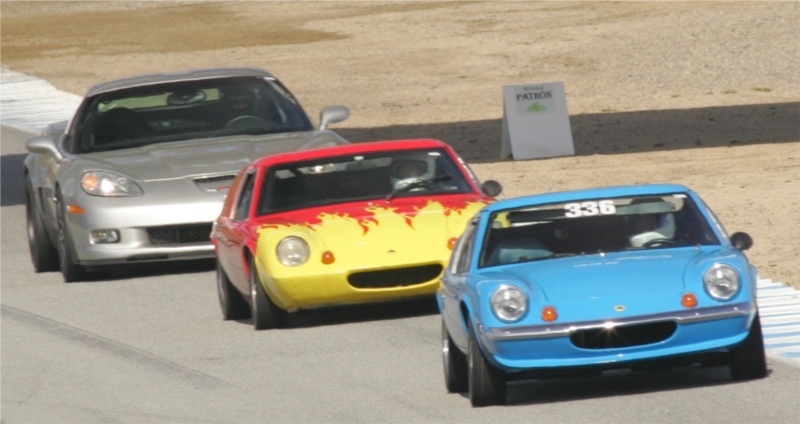 With 35 entrants for the Mazda Raceway Laguna Seca event this was the largest field so far for LotusCupUSA. The DietschWerks normally-aspirated 2006 Exige I drove this weekend performed flawlessly. While the best lap for a Production class Elise/Exige for the weekend was a 1:39.281, my best lap of the weekend was just 1:44.216. The best lap of the Open class was at 1:34.070. The picture is a view down the Lotus garage row showing a few of the cars entered. The CoolShirt white connectors (on me) are a wonderful addition to any warm track experience. Under my driver suit I wear a Coolshirt T-shirt with plastic tubes. In the car one places a Coolshirt bag or box (with its pump). Before a session ensure there is ice (with some water) in the bag or box. On entering the car connect the dry-break connectors on one's suit to the connectors to the bag or box. The small 'Bag' version just suffices for a 20-30 minute session of cooling one's body. When one turns on the provided Coolshirt water pump it feels as if there is cold water running down one's back -- initially disconcerting as it feels like the system is leaking! Good advice I got from Rob Dietsch was to put a limited amount of water (with the coolshirt additive) in the bag and for each session put a quart-size sealable ice-filled plastic bag into the coolshirt bag. At end of session remove the inner bag (now just water) and discard the water. That way the session ice-changes are quick and easy. 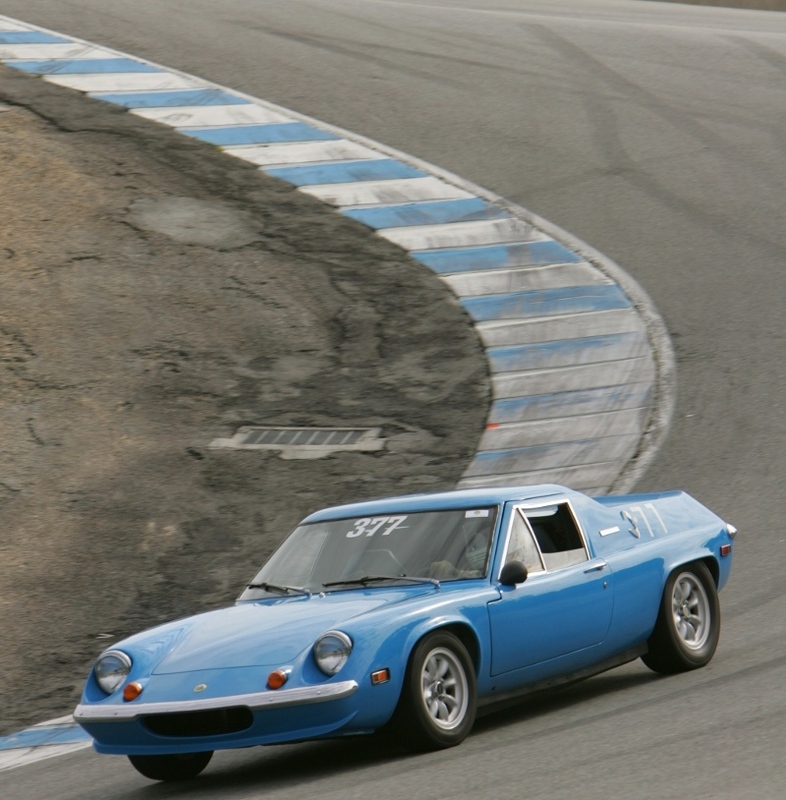 The GGLC was again at Mazda Raceway Laguna Seca April 3. Once again I rented from DietschWerks for an arrive-and-drive trackday because the Europa was not yet ready. This time I drove the Sport 190 for a session and for the rest of the sessions drove a DietchWerks Exige S. I find the lack of rear vision on the Exige S to be disturbing. The turbo air intake/cooler blocks the vision out the rear window completely. It's just me - clearly others are not bothered by the limited rear vision! I was no faster than in a normally aspirated Elise! 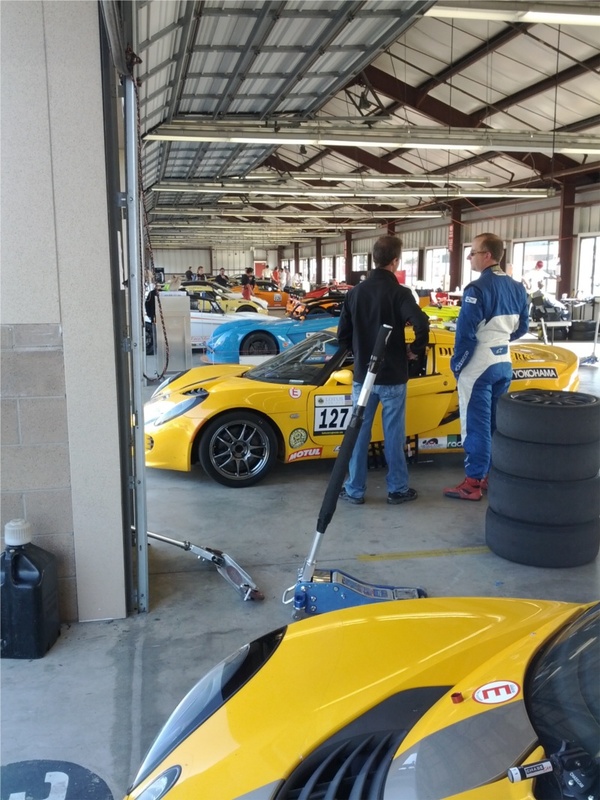 The GGLC was at Mazda Raceway Laguna Seca February 11. Since the radiator changes for my Europa were unfinished, I rented an Elise from DietschWerks for an arrive-and-drive trackday. I don't have any pictures though. We ran the track clockwise (reverse of the usual direction) with the bypass. Meaning those who figured out the right line through Turn 5 and were bold enough to take it fast enough could get all 4 wheels off the ground. That was, um, not one of my goals. My main goal was to have a full day of quality track time with no equipment failures and no significant mistakes, and happily I achieved both goals. I do need to update the radiator for next season to get better cooling for the engine in summer heat, though. The eighth and final autocross of the GGLC autocross season saw me (Europa TC with Zetec 2.0 Liter) pitted against Ben Beames' Europa S2 (Toyota Black Top) for season championship in the Lotus Classic Open class. I was able to hold off Ben with a 44.76 second run, so won the class championship. 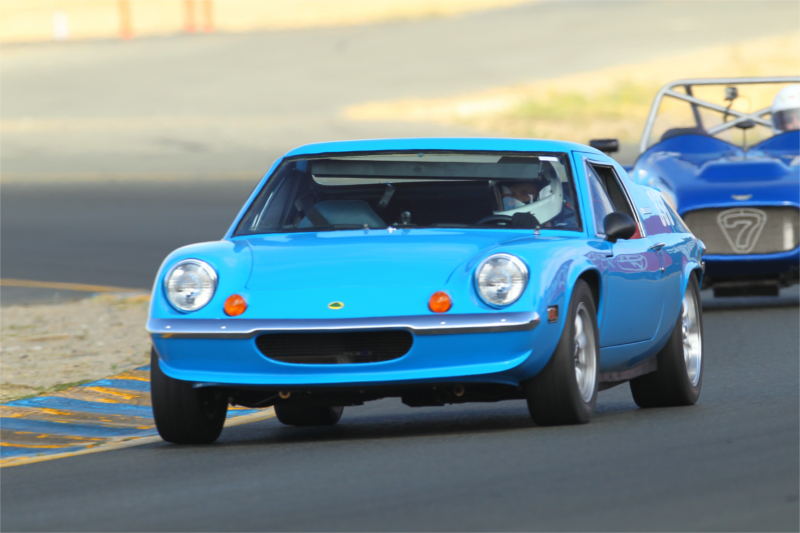 May 11 and 12 was Lotus Cup USA races 5 and 6 at Infineon Raceway (Sears Point) in Sonoma, California. 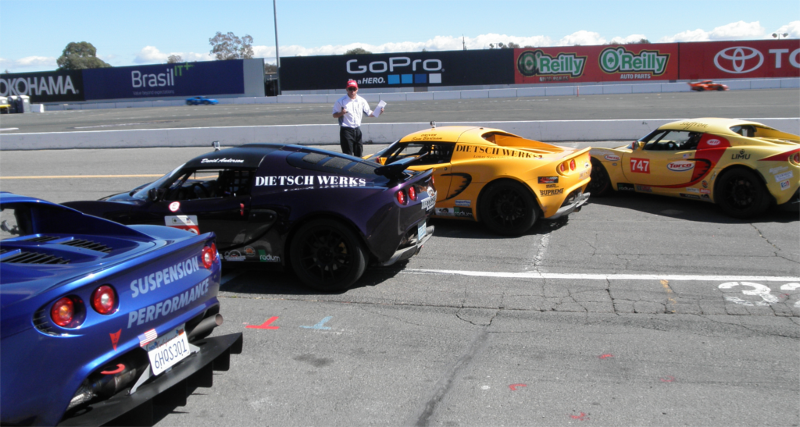 I drove Elise #038 rented from DietschWerks and it was a great weekend. (Rob was out of labels with my name for the door, ignore the Rob Dietsch label over the door as I was driving!) On Saturday after several laps I finally was able to slip into 3rd place and finished there in Production class. On Sunday I battled for 3rd for most of the race but in the end could not find a way past so wound up in 4th in Production class. My better laps of the weekend were in the 1:57 range. The following shows the garage with most of the entrants. 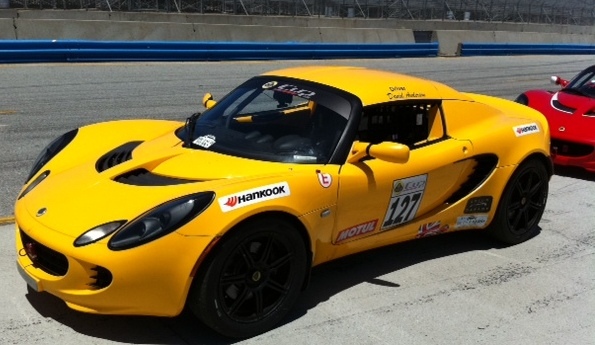 The Elise, Exige, 2 Eleven, and Evora models are eligible for the series and all were represented this weekend. The number 127 car (and Patrice in blue driver suit) were the combination I could not find a way to pass in Sunday's race! The following is me behind Patrice as I was through all but the first couple of laps in the race. February 21 was the first GGLC track day of 2012 and the weather at Laguna Seca was perfect. I had many new systems in Europa so I expected some trouble. In the end the new oil cooler worked fine and the new-to-me NG3 transmission worked fine. However, I made a small mistake at Turn 2 just after lunch and overstressed the weak-link in the new cable-shifter (see the ng3 page for details on the failure). As of March 2012 the problem is fixed! 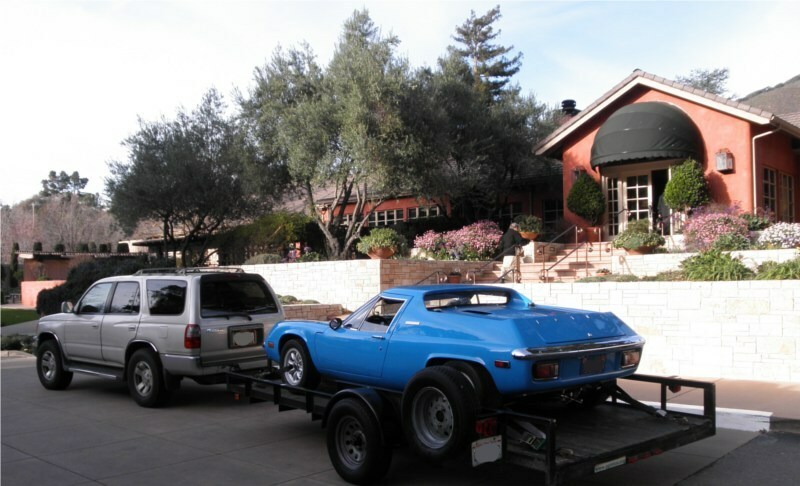 Lacking a picture of my shortened adventures on track I present a picture of our small rig arriving at Bernardus Lodge, where we stay just over the hill from the Laguna Seca entrance. Bernardus Lodge has extraordinary food and service and a nice gravel lot (separate from the car park proper) to park the rig overnight. 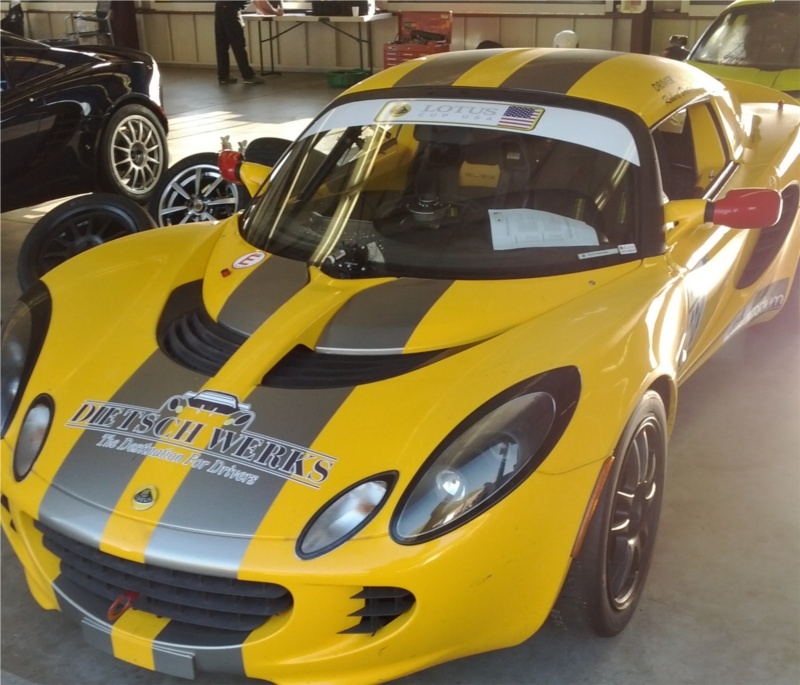 November 11-13 was round Seven of the Lotus Cup USA race series, held at ButtonWillow Raceway. In the picture John and Herb ( staff at DietschWerks)are working on Patrice's Elise, and my ride for the day is in the foreground. 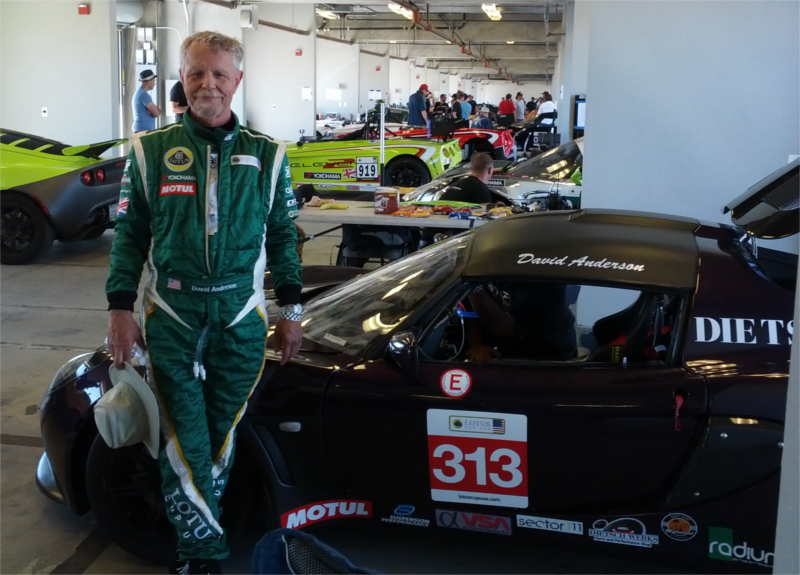 September 10-11 was round 5 of the Lotus Cup USA race series. Infineon was the the site. Here is my ride for the day in the garage for the day (the rest of the Cup cars were off to the right). 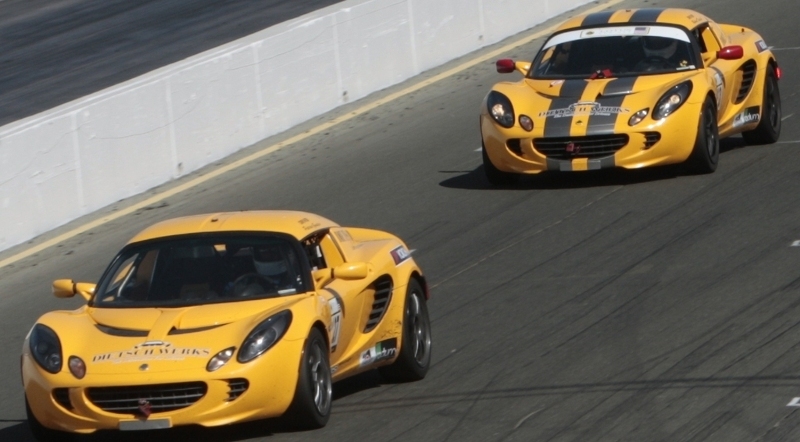 June 24-26 was Round 4 of the Lotus Cup USA race series, and took place at Mazda Raceway Laguna Seca. The race series is described on www.lotuscupusa.us. The Lotus Cup USA folks are good people and run a wonderful race series. Lots was going on all weekend including a GGLC autocross in the paddock and "Corkscrew Mania" time trial (these events on Sunday). 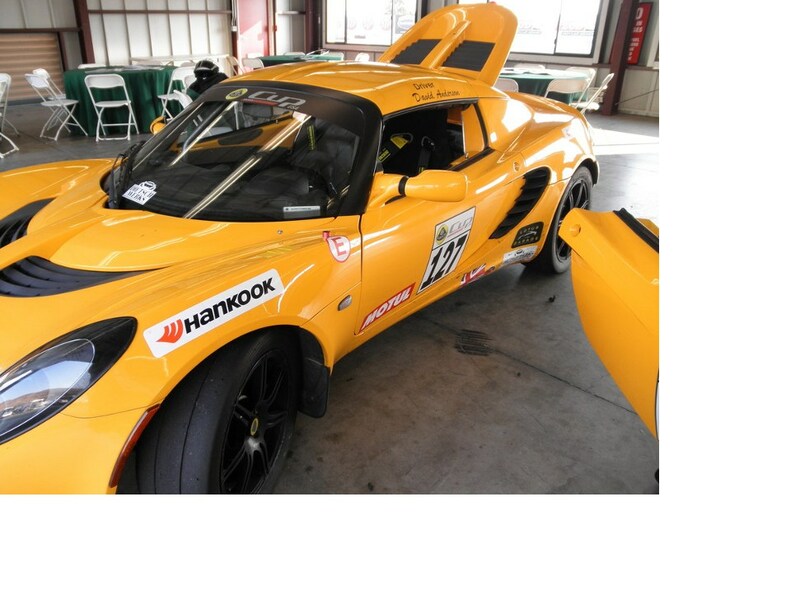 The race series is for race-prepared modern Lotuses with full cages and series-specified race tires. The weather was perfect all weekend though just a few miles away in Carmel it was cold and windy in fog (at least on Saturday). The following picture is me in the yellow normally-aspirated Elise (number 127) followed in the picture by an Exige and another Elise. Photo courtesy Robert Sachs. Lots of credit goes to Rob Dietsch www.dietschwerks.com for getting the car ready and keeping it ready. The folks at www.speedventures.com managed to keep the many on-track events on schedule (there were track-day sessions and a non-Lotus race too). The following picture is yours-truly on grid ready to start a practice session. 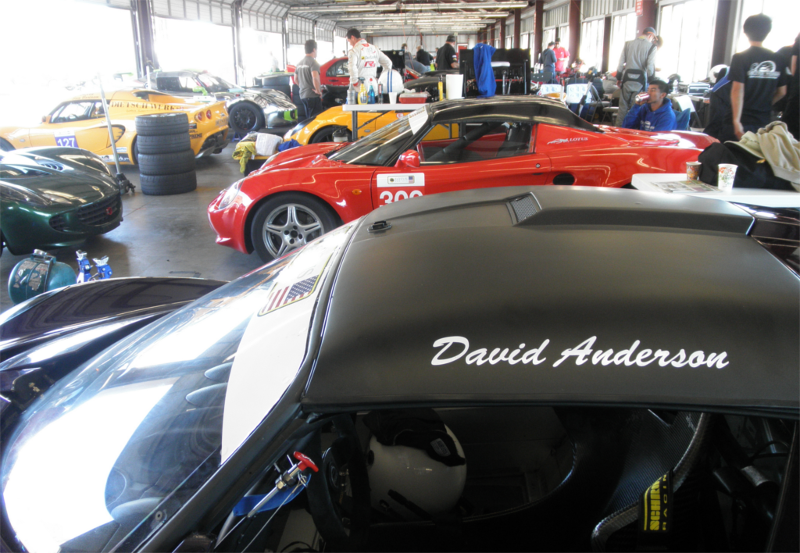 Photo courtesy Jim Navarro, founder and President of the Lotus Cup USA race series. Though rain was forecast at Mazda Raceway (Laguna Seca) the rain held off till after dark so (aside from a 20 minute light mist/shower about 8:00AM) the track soon dried off. The air temp was around 50 degrees F and the low clouds contributed (so it was said) to the many people getting black flagged for exceeding 92DB at the sound booth. Including me, though I never failed sound before. I worked around that problem and enjoyed the day. My lap times (which I record with a DriftBox) showed improvement and decent consistency. Best was 1:52:0 and several were in the low 1:52's. I know several places I was giving away a lot of laptime now I've had time to reflect on the day. In fact I just realized I've been doing something silly for years: focusing more on the apex than on corner exit (oops, got to focus way more on the exit, something I just started to work on at this trackday). It was pretty amazing to see the log showing the nearly 2 seconds of coasting on the front straight when shifting from 3rd to 4th with the original 336 gearbox! Tyler McQuarrie, in a stock Elise did 1:51.5 showing the car's owner the way around Laguna Seca (see the gglotus.org web site for information on Tyler). The next picture is of Team Europa together in the paddock. Team Europa is a group of four Europas regularly entered by their respective owners at GGLC track days.